A warm, uplifting story about a boy, his dog, and the healing power of music marks a first-time collaboration between two former Irish Children’s Laureates, Eoin Colfer and P.J. Lynch. Patrick has been desperate for a dog of his own for as long as he can remember, and this summer, with his father away, he longs for a canine friend more than ever. Meanwhile, in his short doggy life, Oz has suffered at the hands of bad people. Somewhere out there, he believes, is an awesome boy — his boy. And maybe, when they find each other, Oz will learn to bark again. Illustrated in light charcoal by two-time Kate Greenaway Medalist P.J. Lynch, this heartwarming story by Eoin Colfer, internationally best-selling author of the Artemis Fowl series, is certain to enchant. 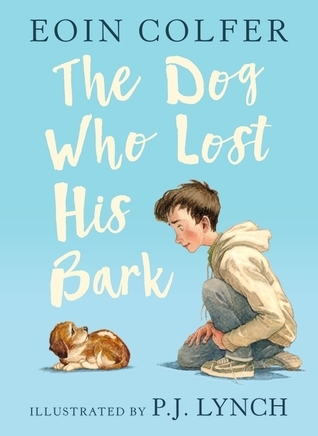 The Dog Who Lost His Bark is a heart wrenching yet heartwarming tale that touches on animal abuse, the wonderful work rescue shelters do, marriage separation and the power of music. Yeah that does sound like a lot to be crammed in 149 pages, but Colfer’s story flows beautifully and accompanied by Lynch’s illustrations this really is a masterpiece. Firstly we meet Oz as a little no name pup, see him go onto to his first home, be abused, then dumped. Secondly we meet the boy, Patrick, going of to spend his summer holidays with his mum at his granddads. As an adult reading the story you pick up up on what’s going down between Patrick parents quite early on, but depending on the age of the child either reading the book or having it read to them, they might only learn this as the character does. Ultimately Boy and Dog end up up saving each other. Through love and care and patience Patrick gets through to Oz and they build a loving friendship. Patrick shuts down after learning the truth of his father abandoning him and his mother for a new woman. Patrick’s instincts is to push Oz away, to push love away. But Oz persists with his doggy awesomeness and finally breaks through to Patrick. Yeah you’ll cry while reading this one. But I think it’s worth it. 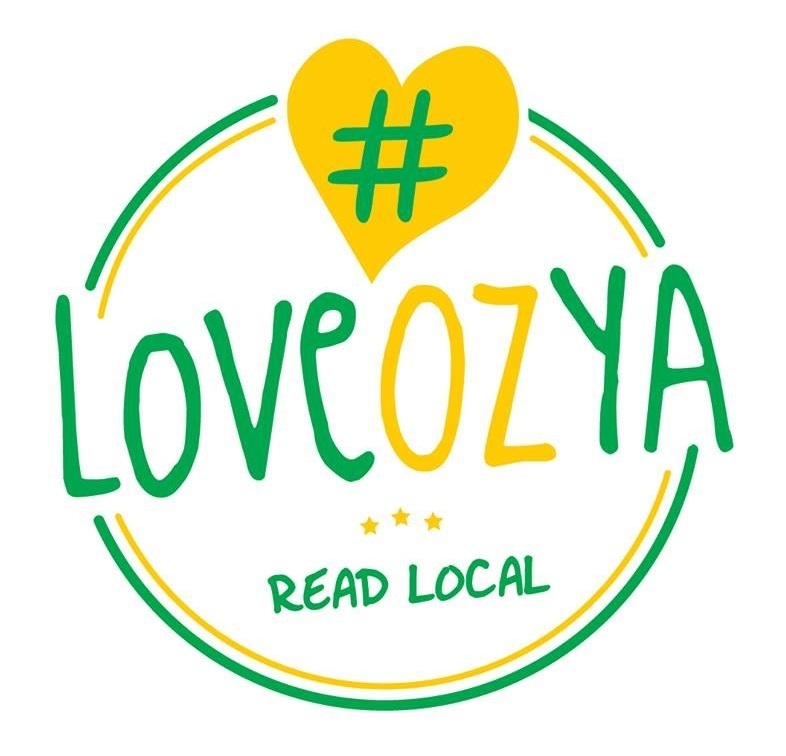 Colfer gives the reader some really important life lessons through a beautiful story of love, friendship and recovery. Hugo the vampire craves red, juicy meat for every meal! But when his eating habits leave him feeling sluggish and bored, he goes on the prowl for something new… Maybe those strange-looking things growing in the garden aren’t as bad as they look? After trying fruits and vegetables for the first time, he discovers the joys of a more balanced diet. The story is told in rhymed verse accompanied by simple, charming, graphic illustrations. 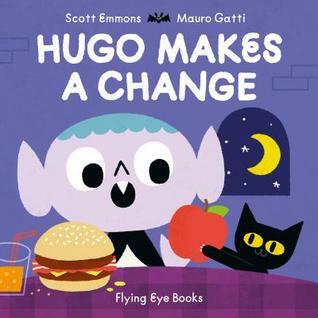 Hugo Makes A Change is a delightful story about a vampire that goes on a journey learning about healthy eating. Plot Summary: We see Hugo eat lots of meat and little else. Hugo then gets sick. He starts to realise there is a connection between his meat heavy diet and feeling bad. Hugo goes off searching for alternatives. At first, he fears trying new things. Finally, Hugo gets the courage to try something new and he enjoys it. Hugo then goes on a journey trying as many different fruits and vegetables as he can find. After eating all the fruits and veggies, Hugo starts to feel well again, to feel better than he’s ever felt before. Hugo goes on to realise he can still have meat in his diet if he pairs it with fruits and veggies. In the end Hugo finds that if he eats a balanced diet he will be healthy and happy. My four-year-old loved the story asking all sorts of questions about what Hugo was eating and repeatedly requesting we read it again. I think this book is a real winner. 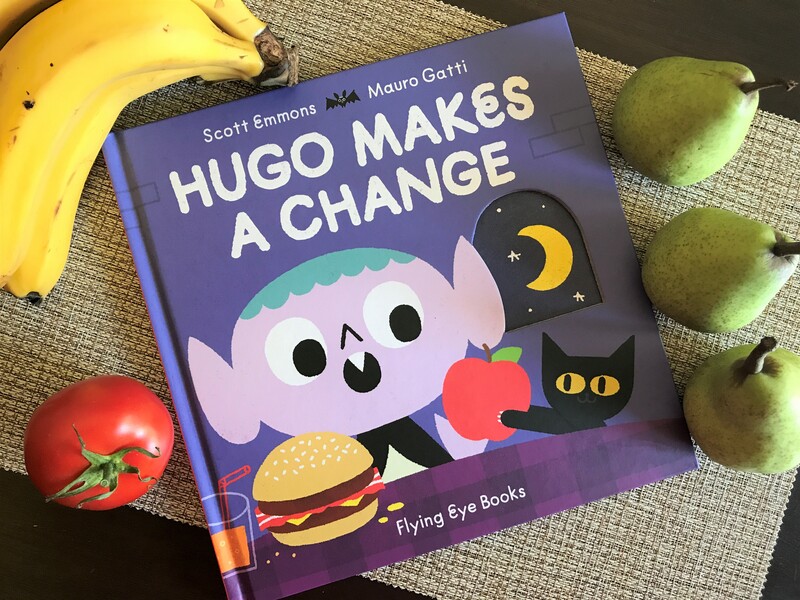 Through Hugo’s adventure in healthy eating children can start to learn the connection between what we eat and how we feel. It is a delight to read out loud with rhythmic sing song sentences and the artwork is easily understood and enticing to a young audience. I think this book would make a fantastic Christmas gift for any fussy little eaters you know. The first book in the Unhinged History series is a ripping yarn–full of adventure and deceit–that brings to life the best-known public spat in all of paleontology: the bitter rivalry between Edward Drinker Cope and Othniel Charles Marsh. This frenzy of discovery and one-upmanship–known today as the Bone Wars–was a gold rush-like scramble to find the most and “best” dinosaur fossils, thus bringing to glory to their respective home-base universities. 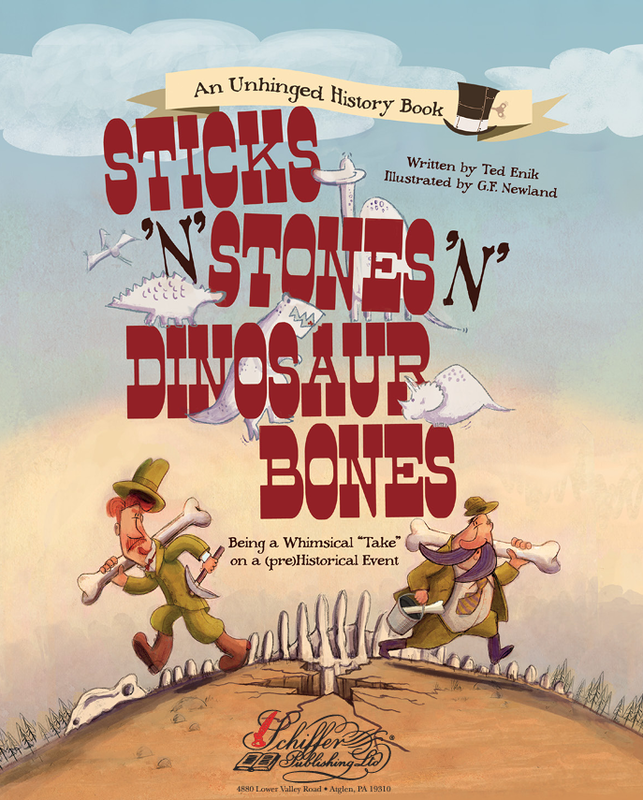 Lively and witty rhymes plus wonderfully demented illustrations reveal how the paleontologists’ infamous rivalry began, and how–despite making genuine and lasting contributions to the field–their mutual obsession with outdoing one another spun out of control. The target audience for this Seuss inspired Palaeontology book is Five to Eight year old’s. When I was that age I wanted to be a palaeontologist when I grew up. Ok I really wanted to be a magical princess who could bring dinosaurs back to life and control them, but same-same. I would have eaten this book up a trillion times over. The rhyming is brilliant, it is informative and humorous and the 48 pages are all full of colourful and fun illustrations. I absolutely adore these type books. The kids will just think they are having fun reading, but they are secretly learning about the early days of Palaeontology. I will have to pick up a hard copy of this book for my son. I know as he gets older he’ll be a dinosaur lover too. I really do hope that these two go onto to do more books like this together on multiple topics – I’ll be keeping my eye out! In his bestselling children’s novel, Australian writer & comedian Peter Helliar takes young readers on a hilarious time-travel adventure about mega mischief, missing limbs, and a grandad with a wicked secret. I’m a fan of Peter Helliar and a lover of time travel tales so I just had to buy this little baby. 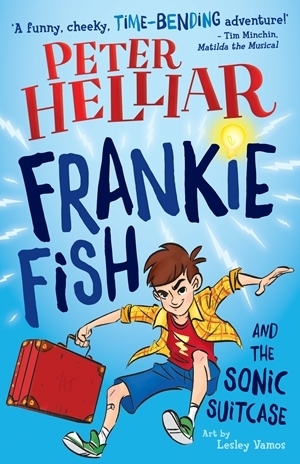 Frankie Fish and the Sonic Suitcase is a humorous action packed tale of a Granddad and Grandson tackling the perils of time travel together. Both the young and old learn valuable lessons along the way and the two different generations of the Fish family bond while on their accidental adventure together. There are wonderful lessons for the younger reader threaded through Helliar’s humour. Lessons about knowing when pranks go too far, the importance of love and family, and of knowing when to leave mistakes in the past and move forward. I am looking forward to sharing this book with my son when he is a little older. I don’t think you could read this book and not enjoy it! Bring on Frankie’s next adventure! From the award-winning creator of Hug, Tall and Yes comes another classic picture book for the very youngest children. Using only a handful of words, Jez Alborough skillfully tells the bedtime tale of Bobo the chimp. The sun is still up and this little chimp wants to play with his jungle friends, but then the sun goes down and he’s all alone… The perfect bedtime read for every playful little monkey! 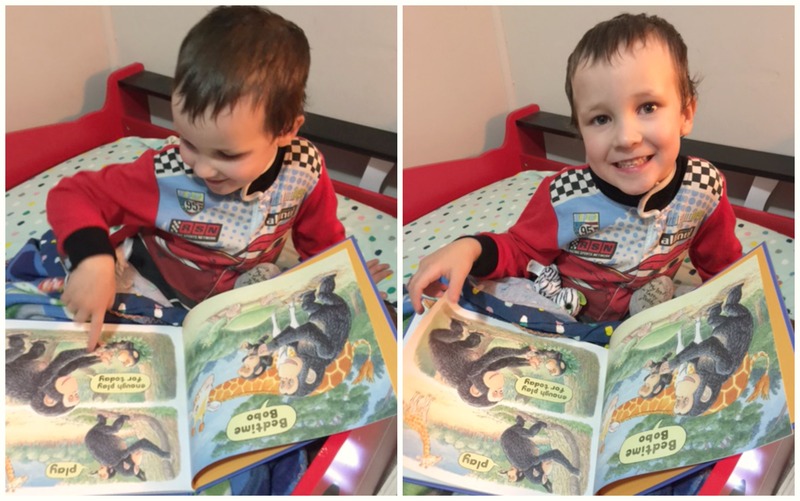 My Thoughts: Riley was very excited when I handed him PLAY and told him we had a new book to read at bedtime. The story follows Bobo as his mother tries to get him to go to sleep. Bobo has other ideas and keeps running off to find new friends to play with, until the sun disappears and he’s alone in the dark. Bobo is rescued and returned to his mother, spending the night in her arms and then watching the sun rise again. Riley was really engaged in this book. He was looking at the images and asking questions about the little monkey and what he was doing. The book opened up conversation on going to bed when asked, doing what mummy says, staying safe, love and even the cycle of day and night. The images are magnificent. There is one image of Bobo sleeping in his mother’s arms that spans across two pages that is breathtakingly beautiful. Jez Alborough is such a talented artist. There are very few words and story is really told through the art. Immediately after we finished reading, Riley requested we read it again. The next morning, he spotted the book sitting on my computer desk and asked, ‘Can we read the monkey book’. Riley has been repeatedly requesting it. We’ve both found a new favourite in PLAY. The perfect bedtime story! I’m Australian! How about you? Many people from many places have come across the seas, to make Australia their home. How Australian is that? Published March 1st 2017 by Scholastic Australia. Mem Fox my dear, I didn’t think it was possible to love you anymore than I did after Possum Magic and Time for Bed, but now I do! 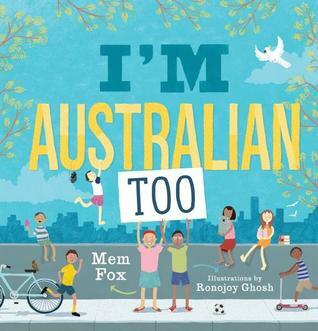 I was so excited when I saw this beautiful book by Mem Fox and illustrated by Ronojoy Ghosh. It celebrates Australia’s multiculturalism, promotes racial equality and shines a spotlight on refugees. All this is wrapped up as a fun and colourful sing-song story to be adored and absorbed by the minds of our young children. Mem Fox you are a wonderful, wonderful woman. I will be repeatedly reading this to my boys. I’m writing this review after just reading I’m Australian Too for the first time with my 3.5-year-old son. He was fresh out of the bath and about to get into bed, perfect mummy and son book reading time. This book is absolutely beautiful. On our first read through when I got to the page that starts with “Sadly, I’m a refugee – I’m not Australian yet.” My spine tingled and a wicked smile crept on my face. I was thinking: You go Mem Fox! Stick it to the haters. By the end of the second read through I had tears in my eyes and was getting choked up trying to finish the last page. My heart is humming and I need to tell the world about this book. READ IT TO YOUR KIDS. Refugees are mentioned. Aboriginals, Italians, Greeks, Somalians – the list goes on and on – are mentioned. It is truly beautiful. The last page ends with the line “Together now, we live in peace, beneath the Southern Star.” Oh Mem, how I wish that was so and I hope for a tomorrow when it is! I’m Australian! How about you? 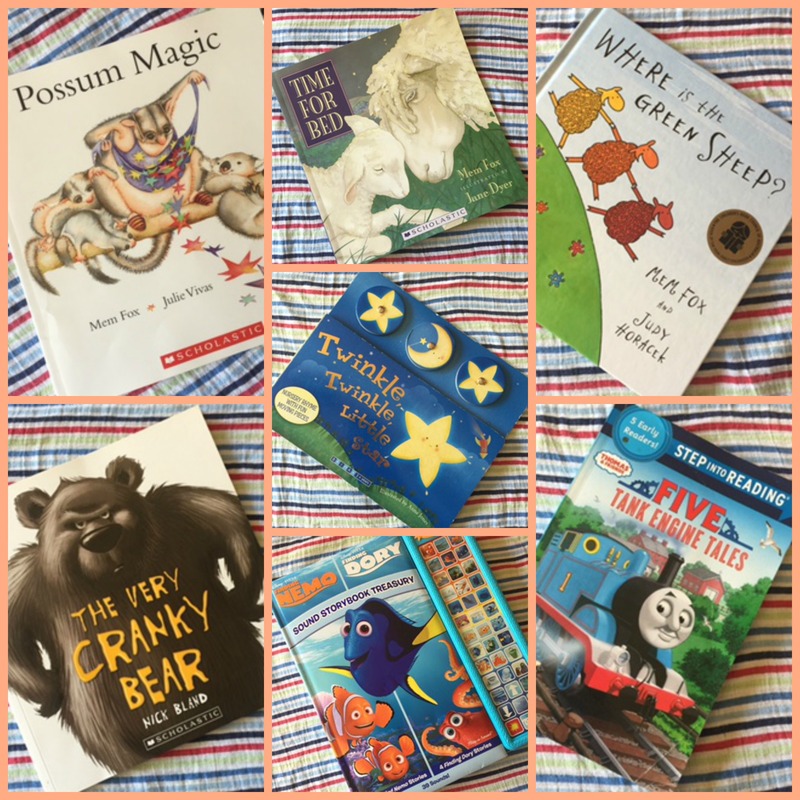 Possum Magic by Mem Fox & Julie Vivas: Oh Mem Fox, everything you touch turns to gold. I doubt there is many a Aussie kid who doesn’t know of Hush and Grandma Poss! Riley and I pretty much read this one every night. The tale of the two possums who go on an adventure around Australia eating people food to try and cure Hush’s invisibility. Gorgeous artwork. Delightful and easy to read out loud. The Very Cranky Bear by Nick Bland: This is the tale of a grumpy bear and the group of animals that try to cheer him up. Ultimately the bear is just grumpy because it’s tired – I can relate to that! The book has bright pleasing artwork, with simple sing-song like sentences. Delightful and easy to read out loud. 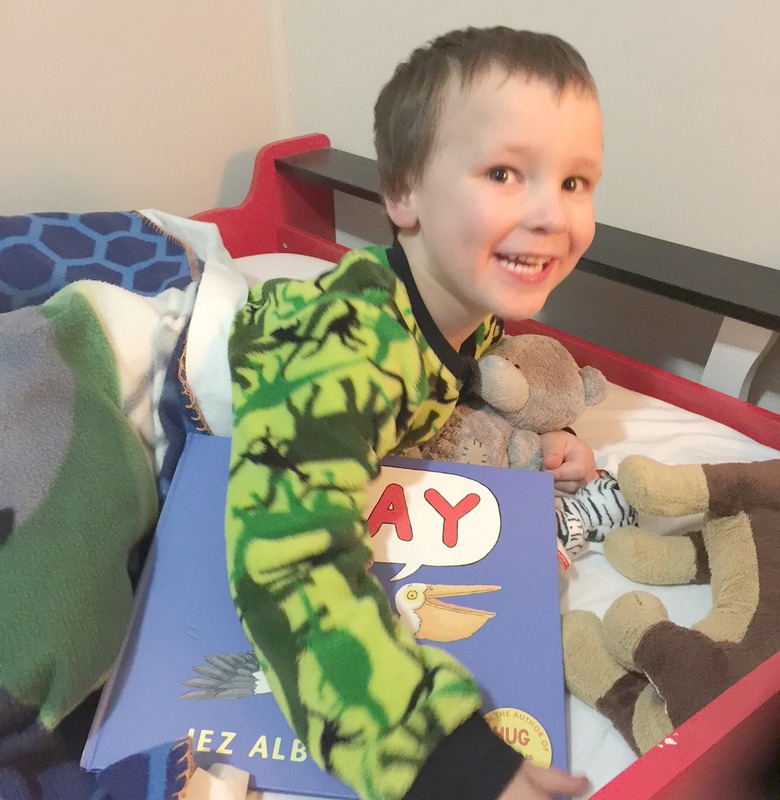 Time For Bed by Mem Fox & Jane Dyer: Riley and I read this book every night as our last book. Our final Goodnight book. The words flow beautifully and we always end up singing it rather than just reading it. It is rhythmic poetry featuring all different animals saying goodnight to each other. Beautiful artwork. Delightful and easy to read out loud. Twinkle, Twinkle, Little Star by Anna Jones. Essentially this book is just the nursery rhyme with illustrations and three pin wheels at the top that you can spin. Riley would be happy just to sing the song and uses the book as an excuse to do so. Finding Nemo & Dory Storybook Treasury by Disney Pixar: The images are big and bright, with eight separate stories based off of the two movies. Riley loves this damn noisy book. It is such a pain when you’re trying to keep the story flowing to keep having to stop to find the corresponding sound effect button! The stories are easy to read ‘IF’ you leave out pressing the corresponding buttons. I cheat half the time and ignore most of the buttons. Meh! Where is the Green Sheep by Mem Fox & Judy Horacek: Every page has a different illustration of a different kind of sheep, with every few pages the question being asked ‘where is the green sheep?’ The green sheep appears on that last page and is finally found. Riley has a green sheep plush toy that came with the book, so sometimes before we sit down and read the book I’ll hide it (somewhere easy) and then get him to find it. Simple sentences, cute artwork and is easy to read out loud. Five Tank Engine Tales by Britt Allcroft: This book consists of five separate Thomas the Tank Engine adventures. The stories in the book are episodes I can remember watching with Riley on TV and thus are based on the original Railway Series by The Reverend W Awdry. The stories are quite easy to read out loud with big bold pictures and very few words per page. Riley does actually have quite a few of the original books, but they are more wordy with smaller pictures. 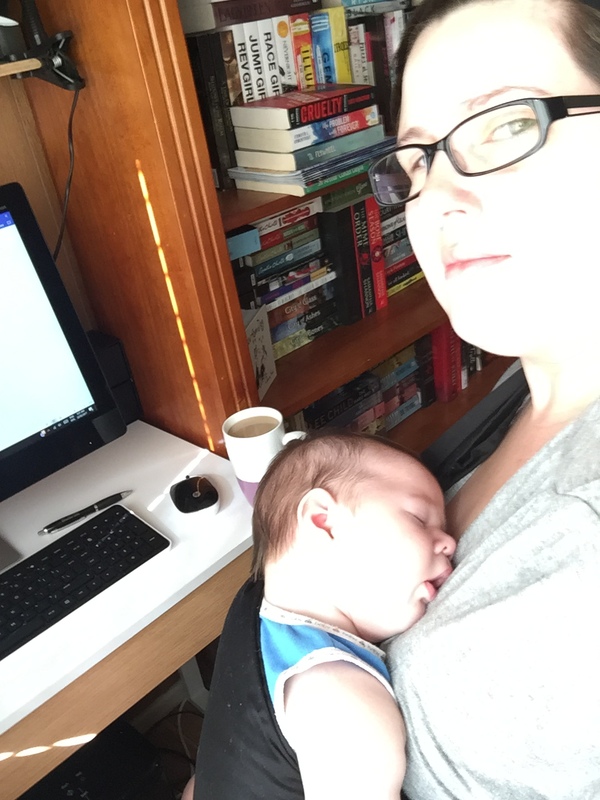 While Riley was super excited to get his books out and “help” Mummy take photos of them, Ethan couldn’t have cared less and chose to sleep.